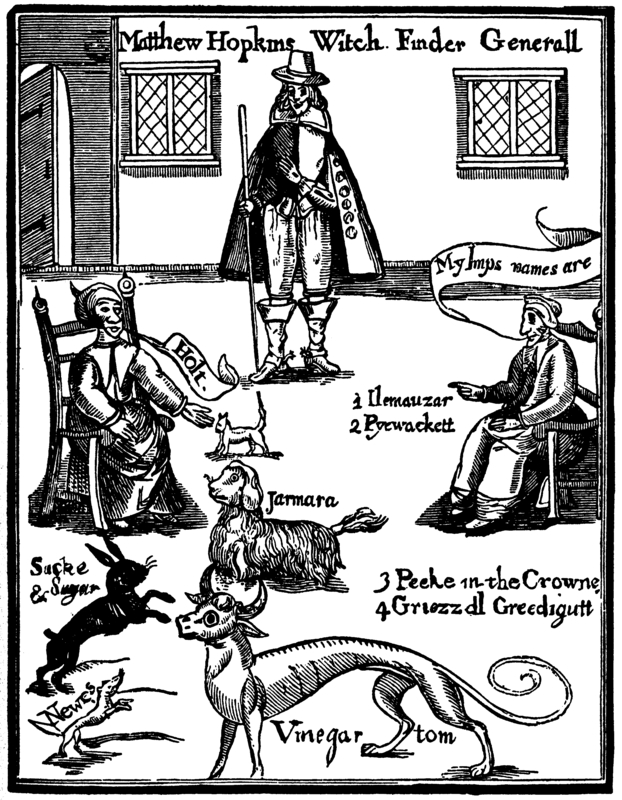 Matthew Hopkins (c. 1620-1647) was the self-appointed Witch-finder General of the English Civil War era. He worked mainly in the East Anglia region. Hopkins, the son of a Puritan clergyman from Suffolk, operated with a man called John Stearne. Several women “prickers” also travelled around the countryside with them, going from town to town to identify those in league with Satan. Although the Witch-finders were only active for three years (1644-1647) they were responsible for accusing approximately 300 women – more witches than England had executed in the previous hundred years! Hopkins found employment as a direct result of the second Lancashire Witch Trials of 1634, whereby King Charles personally investigated the case and finally pardoned all of the prisoners. Thereafter, he demanded a confession, or material proof of a crime, before sentencing a suspect to death. As Hopkins was paid for the witches he uncovered, he developed his own methods to comply with the royal demand. Torture was illegal – but the Witch-finder General used sleep deprivation, ducking (or swimming) witches, bleeding, and the test of pricking the Devil’s Mark. Rumor claims that Hopkins invented a bodkin with a retractable blade. This looked like it was piercing the skin but in fact it made no impact. Because the prisoners felt no pain, and did not bleed, they were deemed to be sorcerers. In 1647 Hopkins published a pamphlet called The Discovery of Witches, but a campaign against his cruel methods had already been triggered by John Gaule, a vicar in Huntingdonshire. As public opinion changed, the Witch-finder’s credibility dwindled and his team was forced into retirement. He died in 1647, probably from tuberculosis. According to local legend, Matthew Hopkins’ ghost haunts Mistley Pond — a spot in Suffolk close to where he was buried. It is said that he still roams the land in search of witches! This entry was posted in History and tagged Matthew Hopking, Second Lancashire Witch Trial, Witch-finder General. Bookmark the permalink.